Growth Habit: Erect, up to 1m but usually smaller. Leaves alternate, triangular, apex pointed, margin toothed. Type of Plant: Fat Hen is a fast-growing erect annual. Germination generally occurs in Spring and Autumn, and will also occur in Summer where suitable rainfall or irrigation is present. Flowers: Greyish – green, forming in clusters. Cotyledons: Narrow-oval, apex round, hairless. Fruit/Seed: Large quantities of small green to grey seeds are produced. Dispersal: Seeds are readily dispersed by soil movement. Wind may also move seeds small distances from the parent. Distribution: Fat Hen is a widespread weed throughout Tasmania, occurring in home gardens, horticultural and agricultural crops, and waste areas. It frequently invades new pastures. 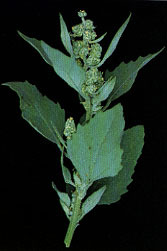 Status: Chenopodium album is not a declared weed under the Noxious Weeds Act 1964. Fat Hen can compete vigorously with seedlings and establishing crops. Infestations may be very dense and can severely reduce harvest quantities. Several generations may occur in one season due to the plant’s quick growth and seed production abilities. Manual removal, particularly whilst plants are young, is effective as fat hen generally produces a shallow root system. Mulching is an excellent method to prevent germinating seeds from establishing. Cultivation may be useful, again as the plant’s shallow root system is easily dislodged from the soil and the plant quickly dries out in warm weather. Several herbicides are registered for use in Tasmania including glyphosate, MCPA, bromoxynil, glufosinate and 2,4-D. Note: All 2,4-D products may be used without restriction from 15th April to 15th Sept, however use outside of these times requires a permit available through the Registrar of Pesticides, DPIWE. Ph: 131368.